Director Darko Tresnjak has created an uncommonly polished and lovely version of one of Shakespeare’s most familiar comedies, with brilliant British touches everywhere. From the typically English elegant costumes (including Hippolyta in jodhpurs) to the stately gatehouse and grounds, to the delicate birdsong and strains of Mozart and Haydn playing softly in the background, the fine hand of a master director can be seen. For those new to the story, it intertwines several different plots: that of four love-struck teenagers, a royal wedding, six bumbling actors, and a feud between a fairy king and his lady. All the performances are exceptional, and truly do justice to the characters, story and poetry of this great classic. 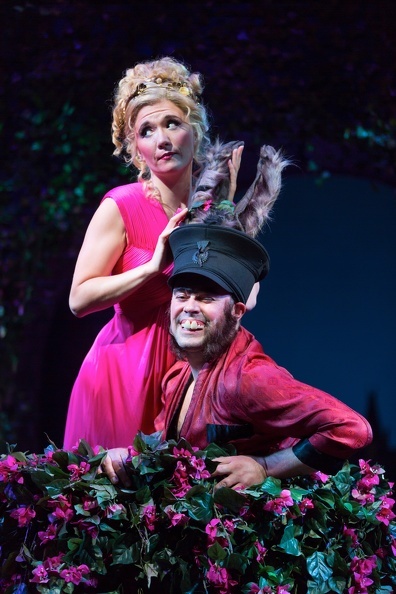 Most outstanding are Fedna Laure Jacquet as the passionate Helena, John Lavelle as the appallingly conceited Bottom, and Scarlett Strallen as the honey-voiced fairy queen Titania. It is great fun to watch the doubling of the actors in several roles (Puck is also Philostrate, Duke Theseus’ manservant, and Theseus also plays Oberon, for example.) Having the Mechanicals as servants in the Duke’s retinue instead of low-life locals is also a clever innovation. As always, the scenery, sound, costumes, and lighting at Hartford Stage nearly steal the show. Designer Alexander Dodge’s gatehouse is magnificent, providing multiple levels for the actors to peer out of archways and windows, and the hedges around the perimeter of the grounds are used to incredible effect as platforms and hiding places for fairies and lovers. Stunning and sensuous soft colors permeate the stage, whether at the Duke’s estate or in the wild kingdom of the fairies, thanks to lighting designer York Kennedy; Sound Design from Broken Chord complements the majestic feel of the production, and the costumes by Joshua Pearson match the characters to perfection, as well as being lovely to look at.